Handcuffed and without emotion, James Kraig Kahler is escorted from the Osage County Courthouse Monday afternoon after receiving a recommendation of the death penalty, following his conviction for capital murder Aug. 25. LYNDON—After deliberating for 55 minutes Monday, Osage County jurors unanimously recommended the death penalty for James Kraig Kahler. The sentence recommendation followed the jury’s verdict last Thursday that Kahler was guilty of capital murder. 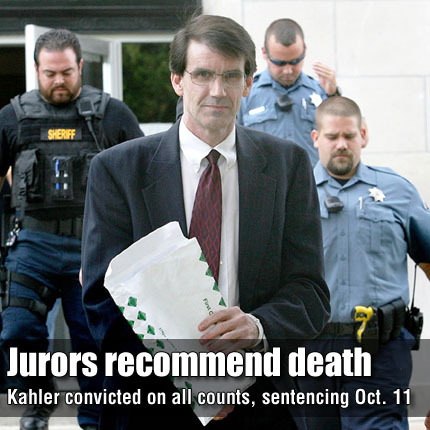 The jury convicted Kahler, 48, of killing his wife, Karen Kahler, 44, his daughters, Emily, 18, and Lauren, 16; and Karen’s grandmother, Dorothy Wight, 89, in Wight’s Burlingame home on Nov. 28, 2009. Kahler was charged with capital murder, four counts of first-degree murder, and one count of aggravated burglary. Following Monday’s death penalty verdict, members of Karen Kahler’s family gathered on the east steps of the Osage County Courthouse to make a statement to the press. Lynn Denton, Karen Kahler’s sister, spoke for the group that included her brother Bill Hetrick, his wife Donna, and Carmen Esch, introduced as Hetrick’s and Denton’s cousin and Dorothy Wight’s granddaughter.